You can boost your immune system by adding Superior Source vitamins to your daily routine. They are the cleanest, purest on the market today and they are also GMO-Free. Superior Source maintains strict quality control standards and they have over 130 vitamins for the entire family – mom, dad, kids and even grandparents! And remember, with Superior Source Instant Dissolve Vitamins, there’s NO pills to swallow. March to Health with Vitamins from Superior Source! No Shot Methylcobalamin Vitamin B-12/Vitamin B-6 w/L-5 Methyltetrahydrofolate MicroLingual® Tablets go to work fast, under the tongue. Other forms of Vitamin B-12 supplementation can result in a loss of as much as 50% of Vitamin B-12 potency in the high acid environment of the stomach. This supplement is a combination of activated B-12 (methylcobalamin), activated Folate (L-5 methyltetrahydrofolate) and B-6, which are three critical B vitamins required for control of elevated homocystein levels. Vitamin C is an essential nutrient that cannot be produced by the body, therefore, it must be replenished daily. Vitamin C has several beneficial purposes including developing and maintaining healthy skin and bones, to form collagen and also enhances the absorption of iron from plant-based foods we eat. Vitamin C also provides support to the body’s immune system. Superior Source Vitamin C 500 mg, “Sour Cherry Melts”, utilizes sodium ascorbate, which is a buffered (non-acidic) form of C that does not contribute to gastric irritation. NO sugar added; only sweetened with a little stevia. This is preferable to most “chewable” vitamin C products that typically are loaded with lots of sugar. 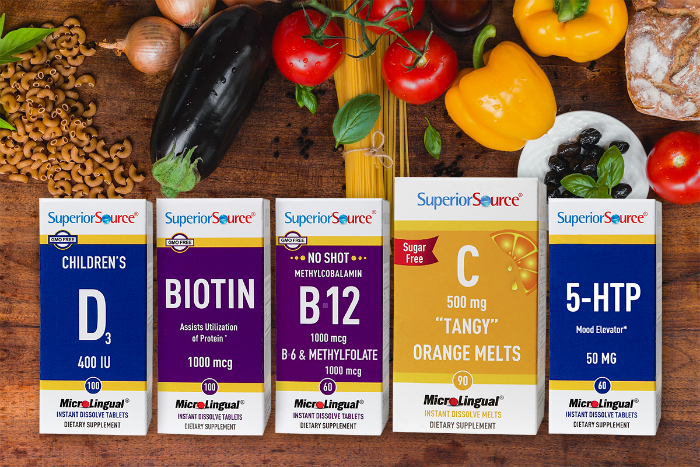 Be the healthiest you can be this Spring with Superior Source MicroLingual® supplements! You can find these MicroLingual® vitamins and all Superior Source Vitamins at major retailers. Use their handy store locator tool to find a store near you. Or, you can purchase from online retailers! I’ve never tried Micro-Lingual vitamins. I’d like to try these because I have difficulty swallowing vitamins as many are so large. I love the fact that there is no pills for the little ones, I know for a few of my grandchildren have a hard time taking pills and I do love that there product is free of gmo and sugar. I have a hard time swallowing pills, but still need to get my vitamins. Unfortunately many come in large pill form and make it hard for me. I will have to check out this brand as I love the fact that they dissolve on the tongue. Much easier. I am glad that this brand does make it affordable for parents to buy their children vitamins, I do love that they have the melt tablets . I do appreciate that these vitamins are easier to swallow, I know my grandchildren don’t like taking any sort of pills , so these would definitely help them get the vitamins they need. Yes, I need to take more vitamins. I like that these are not big pills I have to swallow. Easy to take. I love that these are chemical and gmo free, also easy for kids to take! I really love these, the more I read on them,and one of the things I love is that you won’t have to take pills, I hate taking them , so its nice for someone like me. I would love to give these a try. I am in need of something that works for me. I would like to these vitamins. I really like that there isn’t any fillers in them. glad that they are easy to take not only for me but for the children. I’m looking forward to trying these products. We just recently started taking supplements. I love that these vitamins have no binders or fillers in them, another thing I find great is that they are easy to swallow. I have always had a hard time taking pills because they make them to big and I really love that they carry all types of vitamins your body and your whole family needs. These sound like great vitamins, thank you so much for sharing! I really like that the vitamin c melts in your mouth, perfect for kids! I also love that they allow you to try their products for free with just paying shipping.